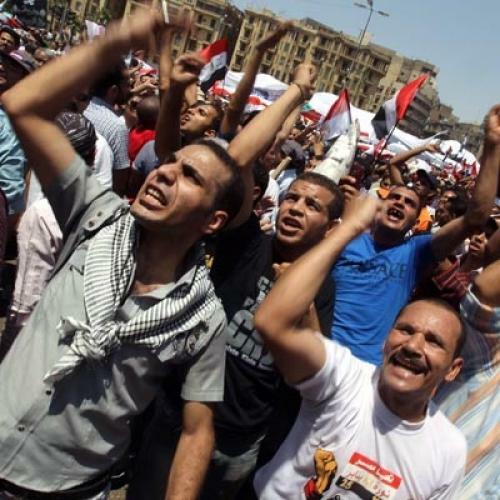 Cairo Dispatch: Why Is the Revolution Stagnating? Cairo—Friday, July 8 was an oppressively hot day in Tahrir Square, hot enough for protestors to wonder whether the country’s unpopular and widely distrusted transitional government was controlling the weather. Yet the government was notably missing from the scene: With activists guarding every entrance to the square, the country’s security services didn’t dare to enter the dusty, shade-free roundabout area where supporters of every major Egyptian political group had gathered in what was described as the largest protest in Cairo since President Hosni Mubarak’s resignation on February 11. (The protest continued over the weekend and is still being held this week.) A week before, in early July, there were vicious clashes between protestors and the police, as well as the alleged burning of Tahrir’s protestor tent city by undercover security agents. Egypt’s governing Supreme Council of the Armed Forces (SCAF)—whose opacity and inertia in reforming the country’s institutions was the ostensible cause of Friday’s protests—was eager to keep tensions at a minimum, which explains its forces’ absence. Yet there was another foe looming at the protest: the sense that Egypt’s revolution might be stagnating. On the one hand, the most recent protestwould seem to indicate that Egypt’s revolutionary consensus is resilient: The groups that ousted Mubarak have drawn little encouragement from the transitional government’s rule and still believe that mass protests are necessary. It is easy to understand why, considering the government’s record. Over 10,000 people arrested during protests over the past six months have been caught up in the military trial system, in which proceedings sometimes last only four minutes, according to Adel Ramadan of the Egyptian Initiative for Individual Rights. The government also has yet to shake some of its most oppressive habits, including the harassment and imprisonment of political opponents. Shahira Abouellail of the organization No Military Trials explained that a military court sentenced blogger Maikel Nabil to three years in prison for writing a post entitled “The Army and the People Were Never One Hand,” a riff on a popular, pro-military protestors’ chant. “We tried to get him out,” she said of Nabil, “and the army literally told us, ‘Don’t even try with this guy.’” Heavy-handed in dealing with dissent and unresponsive in heeding some of the protestors’ most deeply felt demands (such as the punishment of security officers accused of killing protestors during demonstrations), the SCAF and Council leader Muhammad Hussein Tantawi have given the protest movement a reason to redouble its efforts. But the past few days have also exposed the fragility of this consensus. “The Egyptian population feels the revolution is in danger,” said Hosem Al Hamalawi, a prominent left-wing writer and activist. Although most every political movement in Egypt was present on July 8, there was minimal interaction between them. The Muslim Brotherhood erected a stage in the western part of Tahrir; other factions had their own platforms and sound systems, while lampposts, balconies, and even bushes were cluttered with banners from all over the activist spectrum. And the day was not without conflict. A 19-year-old American University-Cairo student told me that, in the early morning hours, Muslim Brotherhood activists had gotten into a shouting match with left-wing protestors. The student claimed that members of the Brotherhood had chased him around the Square, calling him a “takfir,” an especially nasty accusation of apostasy. “I’m, like, allergic to the Muslim Brothers,” he said, while pretending to claw at his forearm. Egypt’s liberals agree that their work isn’t done yet. But they are up against the triple challenge of government recalcitrance, mounting public indifference, and a powerful, often selfish Muslim Brotherhood. Egypt was gripped with revolutionary fervor for 18 days last winter. Although the protests continue, it’s clear that the country is now in the clutches of something far more ambiguous.